Bake cake mix in 2 9×5 inch loaf pans and you use doughnuts for the wheels (even one on back for the spare). Use one loaf for the base of the jeep cake. From the other one, cut one half off for top of jeep. And cut the other half into 3 pieces. (2 pieces measuring about 2 1/4″ X 4″ and 1 piece 4 1/2″ x 1″) Use the two pieces to raise the bottom of the jeep up. And the third piece goes on top next to the half loaf. 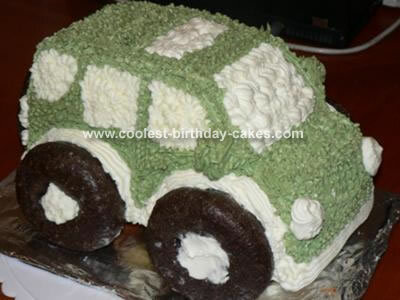 Frost the cake to resemble a jeep and then add the doughnut tires. Decorate as desire.